When I ordered a Cold Steel Bushman I wasn’t sure what to expect. My previous experiences with Cold Steel knives have all been good, but for under $20 I had no idea what I was in for. All I knew for sure was that the knife was popular and cheap, which, as a reviewer, made it an easy purchase to justify. I was pleasantly surprised with the quality, and having now owned and used the knife for a while I’m a little closer to understanding what this blade is all about. The Bushman is billed as a survival blade, and I think it’s capable of all the major tasks. First of all, it can chop and baton – no surprises there. It’s also lightweight and easy to carry, a big plus for me. It could also easily be fashioned into a makeshift spear, very valuable in a survival situation. Finally, the knife is tough as hell and is pretty much indestructible. So yeah, it could certainly work as a survival knife. I also think this could be a decent choice for a bug out bag – especially one done on a budget. This could also be a handy tool for the yard, clearing brush and general messing around type jobs. Finally, this could be great for the cabin, truck or anywhere else you would want to stash an inexpensive but highly functional fixed blade knife. The Bushman comes in two flavors, the bowie blade shown here and a more traditional shape. Both are 12-1/4″ long, have 7″ blades and weigh around 10 ounces. These are slender and light knives, not designed to be serious choppers, but capable of chopping, batoning and being fashioned into spears. If I could go back and buy the knife again, I would have gone with the non-bowie version. I think it would be easier to baton with it and I might be able to choke up and control it a little better for detail work. The blade has a hollow saber grind that starts about 3/4 of an inch up the blade. Cold Steel supplies you with a good out of box edge and the knife has a nice tip for piercing, that held up really well to some of my prying tests. I took this knife to the wood pile in my back yard and went to town chopping, batoning and carving. I processed wood for a couple fires and generally tested the knife the best I could. The blade is 2.5mm thick and has a large flat portion due to the saber grind. I found it batoned “ok” – it would jam easily in dense pieces of oak but could tackle dry pieces of 4-5″ diameter pine without a problem. For batoning in my back yard I would prefer a wider blade with a higher bevel, but the Bushman got the job done. The entire knife is made from a single piece of SK-5 high carbon steel. My research indicates that SK-5 is close to 1080, a durable tool steel. Being a high carbon steel, the blade will rust (and my knife shipped with prodigious amounts of grease on the blade and handle) so Cold Steel elected to provide a black powder coating. The black powder coating is attractive and durable but began to show signs of wear – totally expected. Cold Steel tempered the knife to 54 HRC. The result is that you have an edge which is pretty soft but incredibly tough – excellent for hard chopping without chipping or breaking. I found that the edge held up quite and came back very easily with a couple swipes on my strop. One thing I noticed is that I actually managed to bend the edge a little in testing. Again, we appear to be flirting with the limitations of a thin survival knife made from a softer steel. I don’t think this really hurts anything but is worth noting – I’d much rather see the steel bend a little than chip out or break. The Bushman’s handle is about as simple as they come; it’s a single piece of steel that has been folded into a tube and welded together. What I like about this handle is that you can really beat on it. I would often strike directly on the handle and pommel as I tried to drive the knife through larger logs. Cold Steel claims that the handle / blade transition is capable of withstanding 2000 pounds of force. You could hit this handle all day and it’s not going to break. Another great benefit to this design is that it is very lightweight. Depending on what you like to carry this could potentially serve as a backup knife and is a good option for camping trips and day hikes. I also like how you can easily convert the knife into a spear. This is something I didn’t try out myself, but it seems easy enough to do. As far as ergonomics go the handle is surprisingly comfortable. After working with the knife for an hour I didn’t notice any hot spots. However, the handle doesn’t provide much in the way of traction. If it’s a hot day and your hand is sweaty I highly advise using a lanyard as there is no texturing to speak of. Perhaps you could wrap the handle with some sort of athletic tape or paracord and add some texture. That said, I personally had no issues with slipping and I found the handle to fill the hand well and offer a decent grip considering. The sheath is almost as simple as the knife. It’s made of Cordura and reinforced with plastic sheeting, stitching and rivets. My biggest problem with the sheath is the absence of any means of retention. If you turn the sheathed knife upside down, the blade will fall out. In my mind really this is more of a “pocket” than a sheath. Speaking of pockets, there is a large pocket on the front of the sheath with a velcro flap – could be handy. I’d throw a small strop or stone in there and maybe a fire steel. The only mounting option is a belt loop. Honestly I think given the price the sheath works, but a retention strap would make it work so much better. It might jack the price up a little but I think it would be worth it. This is a sturdy offering from Cold Steel. This is a no frills knife, but for around $25 shipped, I doubt anyone would be disappointed with this simple and hearty blade. In fact, there is a lot to like about the Cold Steel Bushman. It uses a good high carbon steel, is pretty much indestructible, doesn’t weigh much and takes a keen edge. The ability to easily convert the knife into a spear is also really cool. Add a retention strap to the sheath and you have a very capable survival knife that could be pressed into a variety of roles. 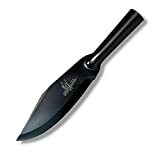 I recommend purchasing the Cold Steel Bushman at Amazon. Please consider that buying anything through any of the links on this website helps support BladeReviews.com, and keeps the site going. As always, any and all support is greatly appreciated. Thank you very much. I’ve always wondered about the CS knives at these prices… thanks for the review! Looks like a fun knife. I’d like to see it on the end of a spear, that might be even more fun….. Thanks man, my pleasure. You know I really should try and make a spear out of it. I’m sure it would work well. For some relatively positive retention you could attach a lanyard just long enough to fit under the pouch’s flap, or if the sheath is rigid enough you could slip a ranger band onto it and slip the knotted end of the lanyard though it, like Blind Horse Knives recommends with their open pouch sheaths. Also, did you close your right middle finger in a door, it looks like there is blood built up underneath it. Mr Random – excellent ideas. I will have to try and implement this to improve the retention. And YES I smashed the hell out of my finger – well over a month ago. Look pretty jacked up and wasn’t the best start to my youtube career. :\ Thanks for stopping by and offering your thoughts. Great review! Cold Steel has some expensive knives but they also seem pretty good at producing really affordable stuff that actually works. Looks like a good choice of knife to buy 3 or 4 of, one for each car, one for the house and a spare or two. Looks like it would be just plain fun to do the spear thing with. I was surprised at the weight you listed…not much more than some of the larger folding knives on the market. Going to have to grab a couple of these for myself!! Thanks man. This one really intrigued me and since I don’t only do high end knives, well, I had to try one out. I totally agree about throwing one in the car and having spares – at this price you can easily do that. I have the more traditional blade of the Bushman. No problem with rentention in the sheath if you place it in the sheath properly. The handle past the blade must also be pushed down into the sheath. Very secure. Similar to some Scandi knives. The CS Bushman is a great beater and survival knife at the cheap. Oh wow, that is a great tip on the sheath. I just tried it with mine and it totally worked – I guess I was just being too much of a wuss with mine – didn’t even think of that! I will update the review and I might even re-shoot the video. You can usually find pretty good kydex sheaths for $30 or so on Ebay. More than the Bushman, but you’re still around $50 for a very usable combo. Hey man, thanks for stopping by! That sounds like a good option, this is a nice blade so an upgraded sheath is a worthy investment imo. Hey Daniel, My pleasure man, glad to hear you have been enjoying the Bushman as well. That looks like a nice upgrade for the Bushman. Thanks for stopping by and offering your thoughts. You mentioned a Bug Out Bag…. Do you have one? And if you do can you do a review/article on it? I really want to get your perspective on the BOB. I did not realize they were dedicated throwing knives, but that doesn’t surprise me given their construction? How is the balance for throwing?